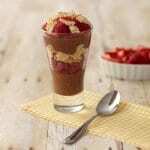 Strawberry Dark Chocolate Pudding Parfaits | JPMA, Inc. In blender container or food processor bowl combine avocado, banana, milk, cocoa powder, sugar and vanilla. Cover and blend or process until smooth, stopping to scrape down sides of container occasionally. Spoon half of the chocolate mixture into four 10- to 12-ounce dessert dishes. Top with half of the strawberries and 1 cup of the cereal. Layer remaining chocolate mixture and remaining strawberries on top. Sprinkle with the remaining 1/4 cup cereal. Serve immediately or loosely cover and refrigerate for up to 2 hours.